I very distinctly remember the first time I encountered Biscuit Bender. It was a Saturday morning, and I was at the Ferry Building for the farmer's market. I was there to actually shop, but the crowds were out in full force, hampering my progress. I needed to get bread from Acme Bakery inside, and I wasn't looking forward to making my way through the hallways inside the Ferry Building, even harder to navigate than the already crowded outside sidewalks. I was a bit grumpy. I wasn't paying that much attention as I tried to find the path of least resistance, but as I passed Far West Fungi, I saw something out of the ordinary. A little popup biscuit vendor. Sure, the Ferry Building has many popup vendors, but what stuck out to me about Van Dao and his biscuit stand, was his signature hat. I realized that I'd just seen him recently on Chopped. I was intrigued. Why was he at the mushroom place? It turns out he was making some biscuits with their mushrooms, but he also had several other varieties, including the very tempting sounding maple bacon biscuit. I had to stop and get a biscuit. And indeed, the bacon flavor came through in the biscuit. The next week I eagerly approached Far West Fungi, with grand plans of getting more biscuits, but alas, he was not there. A few weeks later however, I found him again. He seemed to pop up with no real schedule, but I was always thrilled when I found him. My favorite biscuit back then was the pumpkin chocolate graham biscuit. I remember loving the flavorful buttermilk base, and the exciting mix of chocolate chips, cinnamon, and graham, all in one biscuit. 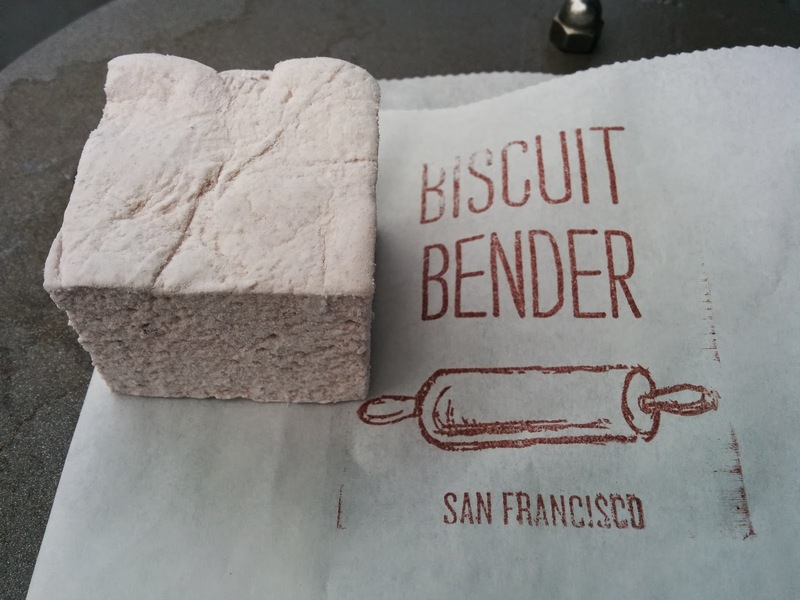 A little while later, I really don't remember, months or maybe even years passed, and Biscuit Bender moved into a permanent stall in the Ferry Building, open every day. It seemed like every time I passed by, the selection of biscuits just continued to grow, from savory (cheesy, sour cream and chive, bacon, mushroom, etc) to sweet (glazed, cinnamon rolls). They even offer frozen biscuits to bake at home, and a selection of jams to enjoy with your biscuits. Even though they have expanded, the biscuits are all handmade and hand cut, all the the signature buttermilk base. A couple weeks ago, a tweet by Biscuit Bender caught my eye. A guessing game. Guess the key ingredient in their upcoming special biscuit for pride weekend, named, the Dixie Diva. Thinking Dixie = South, I guessed pecans. Nope. Then, every few days, they'd tweet out new clues. The one that sealed the deal for me was "Her key ingredient is a sweet and tangy childhood fave!" I guessed correctly, and was rewarded with an early preview of the Dixie Diva biscuit AND another pride weekend special, Pink Saturday Strawberry Marshmallows. You may recall a few years ago that I claimed artisanal marshmallows were going to become the new cupcake. It seemed like I might be right for a while, with tons of places offering all sorts of flavored marshmallows, like the root beer float ones I loved from Tout Sweet. Even Whole Foods made a bunch of flavored marshmallows, as part of their fresh bakery offerings. And then, just like that, the almost-trend seemed to disappear. Since I enjoy real marshmallows (as in, nothing resembling Jet Puff), I was excited to see Biscuit Bender experimenting with marshmallows. The marshmallows are a large size, more than just a few bites. The Pink Saturday tasted, well, fresh, which I know is a strange way to describe a marshmallow, but it wasn't at all dried out or stale. It had a nice stickiness and good fluff to it. But the real winning aspect was the flavor. I have no idea how they infused so much strawberry flavor into this thing, but they did. Intense strawberry, it tasted like summer. While it might be a waste to use one of these in s'mores, can you imagine how good a s'more with a strawberry marshmallow would be? I think it would taste like a chocolate covered strawberry. Will have to try that next! And, the main attraction, the special Dixie Diva. What makes it a Diva? As I mentioned above, that was for us to guess. The answer was ... Pop Rocks! 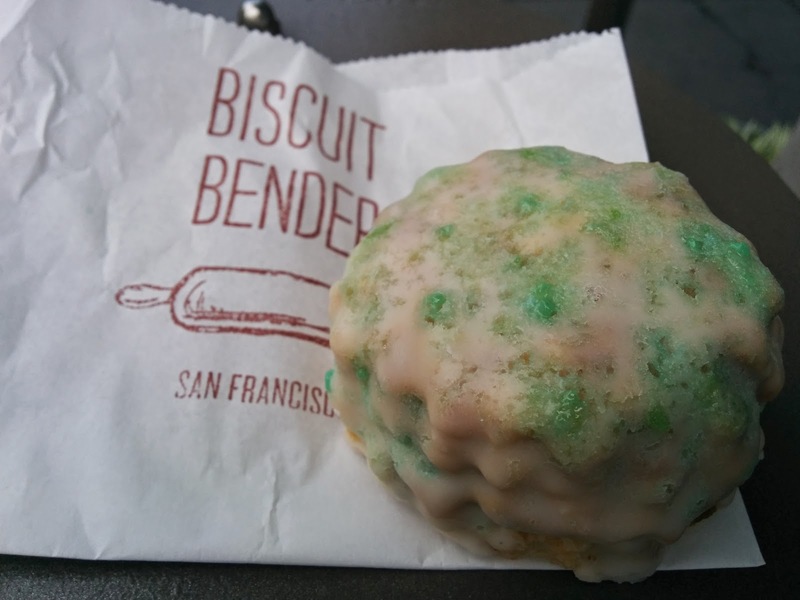 The biscuit itself was studded with Pop Rocks (Sour Apple I think? ), and then it was glazed with an icing that also contained more Pop Rocks. This was a really fun treat. Sadly, the Pop Rocks were there to provide little pops of color, not pops of Pop Rock action. I think the baking process de-activated them. I wonder if they were popping in the oven as they baked? What I loved about the biscuit was the double dose of tang. The first tang was more subtle, and came from the buttermilk in the base biscuit. I always love a good tang to my biscuits, so I was delighted that I could taste the buttermilk here. But the more obvious tang was in the glaze, it was sweetened, but very tangy as well. I'm not sure if there was more citrus added, or if all the flavor came from the Pop Rocks. Overall, this was tasty and fun, although, it would have been even more exciting if the Pop Rocks popped as I ate it!